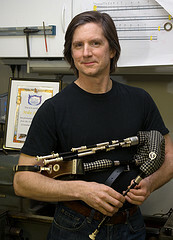 Since 2003 I've been reeding, fettling and repairing Northumbrian and Scottish Smallpipes, in all pitches. I've worked on pipes made by nearly all of the current generation of professional makers, as well as quite a few pipes by previous generations of professional makers. I strive to work in the style, materials and methods of the original maker, be it brass and blackwood, sterling silver and ebony, or nickel silver and lignum vitae to name a few. No job is too big or small. I can do as little as fix a leak, or as much as create a whole set around a few pieces you found in a box. I will occasionally consider commissions for full sets, though my order book is currently full in this regard.